. . . gluconodeltalactone is a substance that is water soluble and slowly breaks down into gluconic acid, thus gradually lowering the pH of whatever it's added to. The alginates can form gels both by crosslinking with calcium, or by acidification, which neutralizes the charge on the alginate chains and thus encourages them to hydrogen-bond to each other. So gradual acidification would gradually gel an alginate solution in the absence of calcium. Adria described encapsulating a mussel in its own juice. While this would make the dish technically an aspic, unlike conventional aspics it remains a liquid. Adria said that though gluconodeltalactone is very new, and they are just beginning to get a handle on it, he is very excited by it. 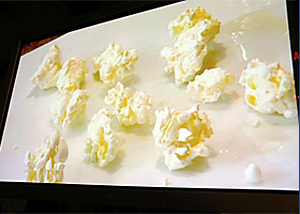 He also demonstrated a machine for spherification on a larger scale than they had originally been able to do, as well as liquid nitrogen and freeze-drying (lyophilization) techniques. At the conclusion of his demonstration -- and thus the Conference -- the audience once again awarded him a standing ovation. Not many people in any business including chefs would be as open with "trade secrets" as Chef Adria is. He is an innovator not only for what he has created but for the subsequent waves of creativity that ripple out from Roses. He does not take enough credit for his business acumen. 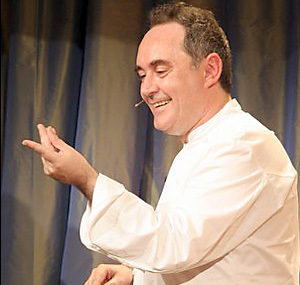 To see the development of the El Bulli brand even over the last few years is remarkable. When will you post your pictures from the conference...I am sure you have quite a collection. An installment will be added every few days and will have some photos with it. Depending on the direction of the discussion and time I may add additional photos. You are right about Ferran and his team. They are incredible innovators in everything they do. In addition they always seem to do it with class. IMO, they are the ultimate culinary professionals. Thank you for your role in making the conference the incredible success that it was! Thanks, Ted. Like the Star Chefs ICC, I felt like a kid in a candy store again. I found the focus of the two conferences sufficiently different to complement each other. 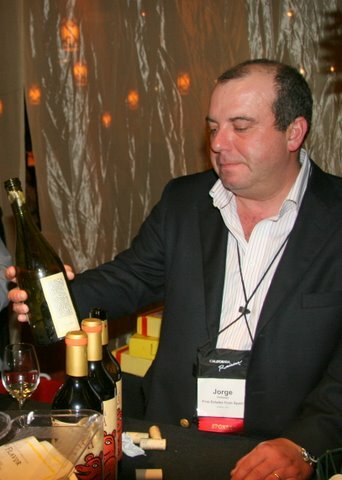 Now someday, maybe I'll get to Madrid Fusion or Identita Golosa - not 2007 though! Thank you for taking the time and making the effort to write about this event. Your excitement is contagious! Reading about this conference, and reading what goes on at "Ideas in Food", maybe the real revolution that is taking place is the willingness to share and the generosity of these chefs. It really is inspiring. Thanks for reading and commenting, Judith. I agree that the willingness to share techniques and concepts is a noble one. It is also necessary for this movement to grow and to be something more than a mere curiosity. Adria and others like Alex Talbott and Aki Kamozawa of Ideas in Food freely share their ideas and engage in discussion with all interested parties. This is truly wonderful and something that we all benefit from. One thing that their meticulous documentation accomplishes is that it clearly leaves an account of what they have done and when, so while they are sharing their ideas it becomes more difficult for someone else to claim them as their own. Proper attribution is important in this context and allows for the free flow of these ideas. Adria is happy if anyone else feels interested enough to use the techniques and concepts that he and his team have introduced so long as those techniques and concepts arre not claimed as having originated elsewhere. The unique dishes produced with the help of those techniques and concepts clearly belong to the creativity of the one who made them and not to the originator of the techniques and concepts. I believe that this is a critical point for Adria. Technique and concept are important, but the most important element is how they are employed and what the final product is. Very well said and accurate comments, John. In my naivity, and enthusiasm, I'd forgotten the attribution aspect. There is still a humbleness coming from the chef's that we've spoken about, and that is also part of the appeal. Fantastic report. Looking forward to the rest of the installments. Did they happen to mention the dates and theme/topic for next year's conference? Thanks Mark. more is on the way. To answer your question, next year's conference will be Nov. 1-3 on "The Rise of Asia." It should be outstanding. Unfortunately for me, I will be unable to attend. 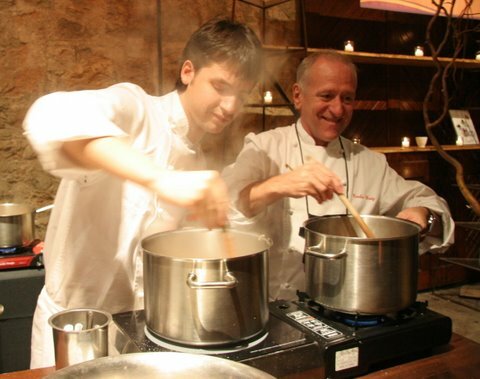 As you know, I am a traditionalist when it comes to cooking, but my background includes influence from Jacques Maximin as well, going back to when I worked with Joachim Splichal, another Maximin protégé and culinary wizard in his own right, for a short year’s stint in the mid 80s. These are two men who can literally pull inspiration from the air. While I am a bit nervous about eating something called gluconodeltalactone, I am fascinated by the depth of thought going on in these kitchens. Hi Pamela, I am glad that you have enjoyed this so far. While something called gluconodeltalactone does indeed sound intimidating, I wouldn't be too put off by it or other agents such as Xanthum gum, Calcium Chloride, methylcellulose, etc. These are scientific names for elements found in many "natural" foods that are eaten every day. They are not "designed" by chemists as are certain pharmaceutical agents. The elements are extracted and applied for specific purposes. Most of us would have no trouble adding specific elements for taste even if we don't know the scientific names of the elements. This is really no different, except that the end result is not specifically taste, though equally as important to the perception and reception of a dish. Your comments on Italy are fascinating. I have had the pleasure of dining at Bottura's restaurant when in Modena back in 2003. He had literally just returned from a World of Flavors Conference that focused on the Mediterranean. Though Bottura spent time working at El Bulli before he opened his restaurant, I remember the food there at the time to be creative but not overtly "scientific." 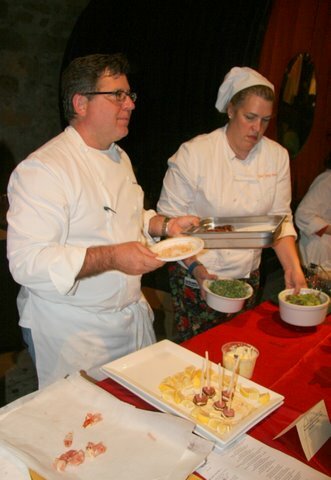 He used local ingredients in new ways and did riffs on traditional dishes. I did enjoy that meal very much and would love to return to see how he has evoled in his cooking. 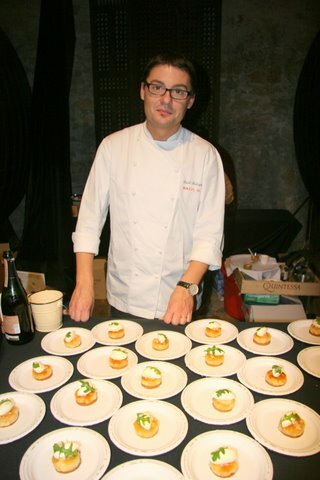 As for Davide Scabin, while I have not yet visited his restaurant, Combal.0 in Torino, it is very high on my list of restaurants that I would love to get to. I had the pleasure of meeting him and spending a little time with him back in September in NYC. He is an extremely thoughtful, intelligent and fun human being. I can only imagine his food being the same. An interesting sidenote since you brought up the subject of Italy, is that many of the Spaniards are very much aware of having been in the shadow of Italy, especially as regards attitudes towards agricultural products like olive oil, wine, vinegar, seafood, rice, etc. and even traditional dishes such as canneloni and even the tortilla Espanola, a version of which I ate regularly growing up with a Campanian mother. While top quality Spanish ingredients are indeed second to none, I found this attitude a bit defensive and probably the result of returning to the game late and having to play "catch-up." 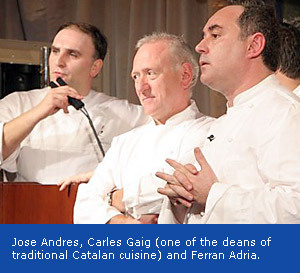 Pamela, you also touched on the influence of Jacques Maximin on Ferran Adria and others including ultimately yourself. Funny, but prior to Adria's talk I was not even aware of Maximin let alone his influence. That just points out my own ignorance and inexperience and I consider myself someone who is into history! 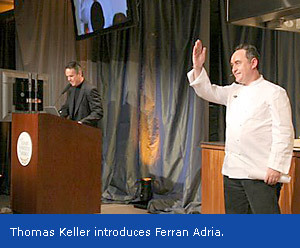 What struck me at the conference from listening to Ferran Adria both in the talk/demo written about above and his small demo, is how into culinary history he is. Like any good historian, he does not simply no dates and who did what. He understands very well the relationships and complex interweaving of history, in this case culinary history. To me this emphasizes that he is not a person just doing things "willy-nilly" like "a mad scientist" as he has so often been described. Adria is very much aware of what he is doing and why. From what I can see there is nothing "mad" about him at all. El Bulli is far out of my realm---I will never sit and savor on that hallowed ground, but your telling makes it of the utmost interest. The ability to convey an experience is a lovely gift, and I'm sure that the majority of the readers will gain their insight from the written word, not from the tastes and aromas and atmosphere and the plated landscapes of the ACTUAL. Your descriptions of the rich history being made in those kitchens are outstanding, and I'm looking forward to the next chapter. That is certainly an inspiring list. Or something to aspire to. 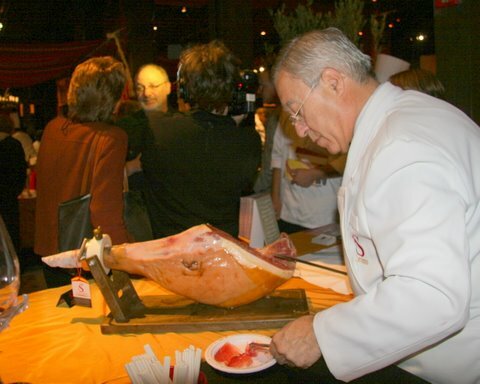 American interest in Spanish cuisine has grown exponentially in the last two decades. Reams of press concerning the rapid growth and incredible success of Spanish “alta cocina” have certainly contributed to and reflected this phenomenon -- most notably that covering the person and work of Ferran Adria and the team at El Bulli in Roses, Catalunya, and chefs like Juan Marie Arzak in the Basque country. While Spanish “alta cocina” has gained esteem in the United States, its success has opened the door for the traditional cuisines of Spain. “Spain and the World Table,” the latest of the annual World of Flavors Conferences held each November at CIA/Greystone in St. Helena, California, was convened to explore, demonstrate and highlight the full range of this extraordinary cuisine. Not long ago, few in the United States had had authentic paella -- or even knew what it was -- yet it was one of the few dishes that people in the U.S. would have identified as “Spanish.” Another would have been gazpacho. Even for those who did understand and appreciate these and other dishes, difficulty in sourcing quality Spanish ingredients such as pimenton, piquillo peppers, and Spanish jamones amongst others important to the cuisine made it near impossible to make or eat many true Spanish flavors. Fortunately, that is changing; all of those ingredients and many more are now available at excellent quality in the States. So while dishes might not be quite the same as they are inside Spain, they can be made to reflect the style, spirit and sabor of their original counterparts: now, the flavors of Spain can enliven the cooking of America. Today Spain is known as a hotbed of culinary innovation and creativity, but it's not really a new development. Spain has been an arena of creativity since its earliest days, incorporating Phoenician, Roman and Arab influences and products into its cuisine. The sixteenth century arrival of peppers, tomatoes, potatoes and cacao (amongst other things) from the Americas sparked a revolution -- not just in Spain, but throughout the world. The current pace of creativity and production now seems all the more startling in contrast to the mid-twentieth century years of culinary and cultural repression and homogeneity. We Americans have been enamored of French cuisine, with its dazzling kitchen techniques, since the days of Thomas Jefferson, if not even well before; more recently we have come to embrace la cucina italiana with its profound understanding of materia prima, the importance of ingredients. And now, perhaps, with the dawn of a new century, it’s time for us to get to understand, to appreciate, to value la cocina española which brings us both techniques AND ingredients but perhaps more importantly a dazzling sense of risk, experiment, of options previously undreamed of that are still somehow grounded in the reality of Spanish tradition. As with many culinary traditions, select ingredients are key to those from Spain. 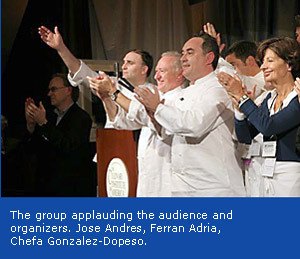 Conference Chairman Jose Andres, bounding about the stage, led the presentations that focused on the use of six specific ingredients that have flavored the Spanish table and shaped its contribution to world cooking. The first focus was on olive oil. Spain is the world’s largest producer of olive oil and is justifiably proud of its quality. Mari Carmen Velez, chef from La Sirena Restaurant in Petrer-Alicante created allioli with olive oil, lemon, garlic and salt. 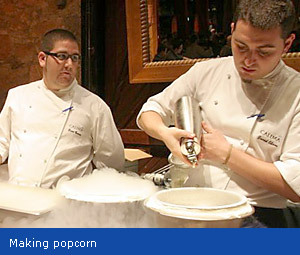 Dani Garcia, chef of Calima in Marbella, demonstrated a new approach to using olive oil when he combined it with tomato water and dropped it into liquid nitrogen to make his version of “popcorn”. Though he served this “popcorn” unadorned during the subsequent “World Marketplace,” later in the conference he showed how he uses it as a culinary accent. 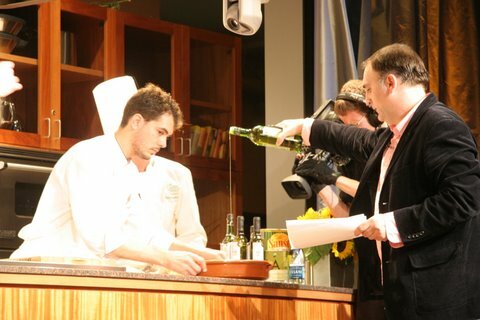 Jose Andres and Ruben Garcia from THINKfoodGROUP in Washington, D.C. demonstrated the making of a “pil-pil”, the traditional Basque dish using salt cod and olive oil, with the gelatin from the cod itself contributing unctuous viscosity and flavor to the result. 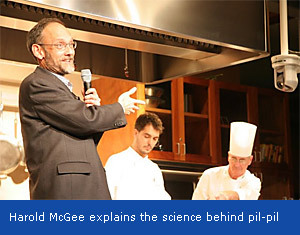 Harold McGee was onstage to explain the scientific process for this bit of traditional culinary alchemy. 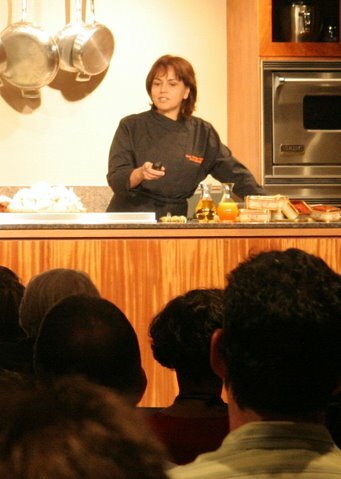 Maria Jose San Roman, chef-owner of Restaurant Monastrell in Alicante, showed a video on saffron production and spoke on the intricacies of its use. She suggested that saffron be infused for longer periods of time to achieve its fullest and best effects. She is currently in collaboration with the University of Castilla-La Mancha, exploring saffron and its applications. Other ingredients highlighted included salt, garlic, tomatoes, peppers and wine. The conference adjourned for exploration of “The World Marketplace”, where wonderful foods and wines from Spain were to be had. Though it was crowded, it was worth wading through to the various booths. Unfortunately, it was difficult to encounter every booth, but it wasn’t long before hunger was sated by the variety of offerings: cochinillo from Candido Lopez Cuerdo, Dani Garcia’s “popcorn,” Carles Gaig’s “Juicy Seafood Rice with Lacquered Hook-Baited Squid,” Spanish cheeses and wines, Paella Valenciana by Rafael Vidal, Miguel Palomo’s fried anchovies, Norm Van Aken’s “Moorish Lamb ‘Espadas’ with Recado Rojo and Lemony Allioli,” Serrano ham hand-carved by Pedro Barba Gil, tapas with uni from Jose Andres, Oriol Balaguer’s “Concept Cake” and many more. The opening of the Conference provided a lot to digest -- in food and thought. Plenty more would follow. I have a few additional photos to add from Day One. 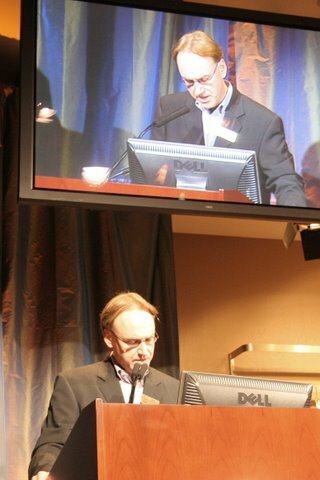 Greg Drescher, creator of the World of Flavors International Conference and Festival welcoming all the participants. Mari Carmen Velez of La Sirena in Petrer-Alicante, spain demonstrating the making of an allioli. 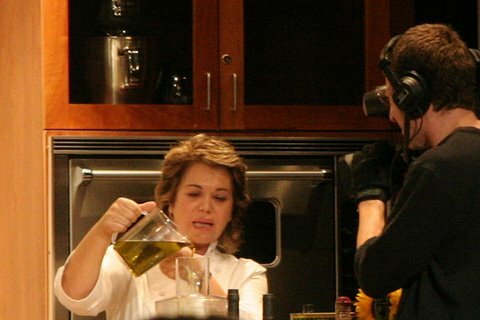 Maria Jose San Roman of Restaurante Monastrell in Alicante, Spain talking about how to use saffron. 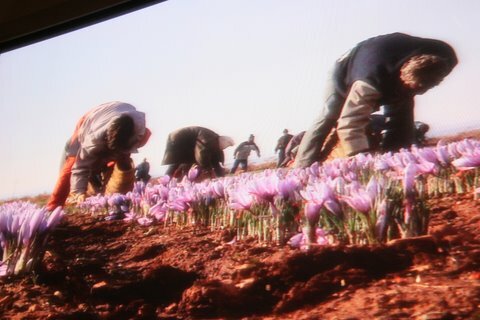 Video image of workers picking the saffron crocus in Spain shown during Maria Jose San Roman's presentation. 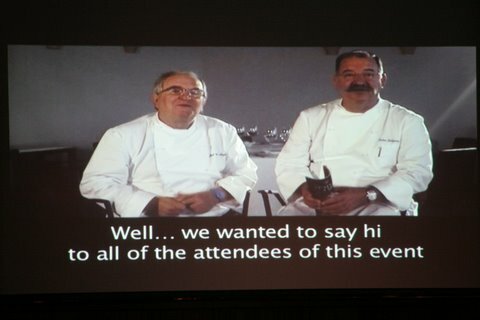 Two Spanish chefs who wanted to be at the conference but were unable to attend, Juan Marie Arzak of Restaurant Arzakand Pedro Subijana of Akelare, both in San Sebastien, Spain conveying their regrets and best wishes via video. Dani Garcia of Calima in Marbella, Spain, handing out samples of his "popcorn" at the World Marketplace. Carles Gaig ® of Can Gaig in Barcelona and assistant serving his "Juicy Seafood Rice"
Norman Van Aken of Norman's in Florida serving his Lamb "Espadas"
Spanish wine importer, Jorge Ordonez selecting wine to pour. 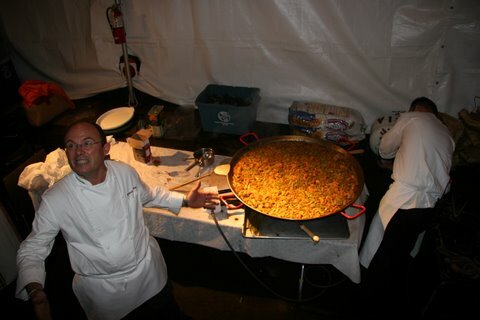 Rafael Vidal of Levante in Benissano', Spain making a paella for the evening's festivities. Miguel Palomo, chef-owner of a small bar-restaurant in San Lucar la Mayor in Sevilla, Spain and assistant frying fresh anchovies. Oriol Balaguer from Barcelona standing in behind his desserts. More photos will follow additional installments. I scrolled ALLLL the way to the top and back, and see not a glove in sight. Is it because of the occasion, or is there a bias against having those crinkly condoms between the chef and the WORK? They're a pesky nuisance, and are they not required except in the USA? Interesting observation. Personally I think that the gloves are no substitute for good hygeine. Even with the gloves, good hygeine is required and may not be present. Funny thing, I ate at a sushi restaurant last night. some of the sushi preparers had gloves on while others didn't. The cheap gloves used in most food prep areas would drive me crazy. I don't even like wearing high quality surgical gloves for too long and they are relatively comfortable. Wow, Thank you for the great posts! It really brought back memories of my externship in spain. I wanted to ask a follow up question about Maria Jose's talk on infusing saffron... What is the new thinking as regards to time/temp of infusion? And did she touch on infusing into oil v. liquids? Hi Arturo, thanks for your attention. I don't recall all the details of her talk, but one thing that does stand out in my memory was that she thinks saffron should be infused in liquid for longer periods of time than most people do so as to get the full flavor. I do not recall her talking about infusing into oil, though I would be surprised if she hasn't been doing that or at least looking into it. She is considered, at least by many of those at the conference, as perhaps the world's foremost expert on the culinary uses of saffron. 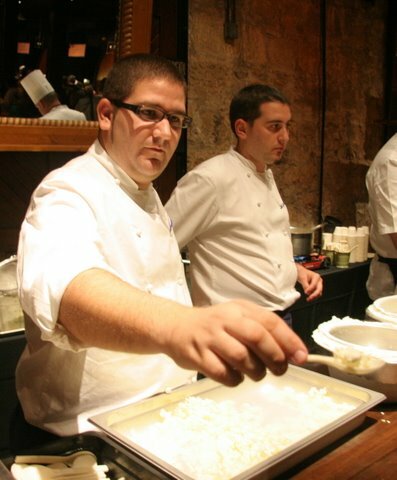 I'm glad to see all these spanish chefs cooking there and not only the superstars but also the very important keeper of the traditional essences, the ones like Benissano's Rafael Vidal or Alhucemas' Miguel Palomo whos cooking is as important (or even more because there are more people eating paellas and fried fish than foams and nitropopcorns) than the top notch chefs. Thank you, Rogelio. Not only were they cooking, they were afforded the true respect that they deserved. One thing that was apparent at this conference is that their is no real dichotomy between the traditional and the vanguard in the cooking of contemprorary Spain. Not only are they not mutually exclusive, they actually reinforce and support each other. Maybe it is because the vanguardists support the traditions already existant while creating new ones. Of course that is not to say that all cocineros in Spain are one huge happy family exuding respect and good will towards each other. As with any area in life there are personal rivalries and enmities, though none were apparent here. Then again maybe those cocineros didn't come if they were invited.